Recently there has been a variety pack of beer released known as The Texas Craft Pack, which features 2 cans each of 4 different beers from various Texas based breweries. To be honest, I was actually surprised that this was released in San Antonio, as the breweries involved in the pack are normally not distributed here. I am very glad that it is available though, as I get to try new beers from the great state that I reside. 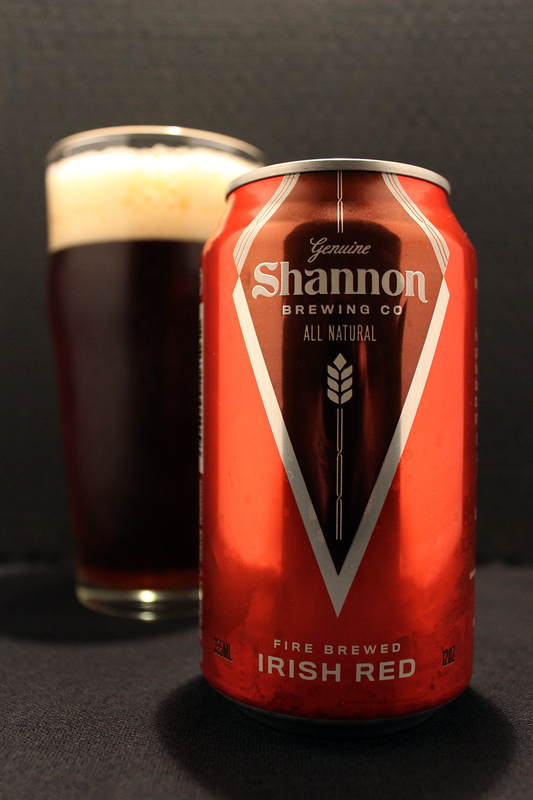 Shannon Irish Red comes to us from Shannon Brewing Company from Keller, TX, which is located just north of Fort Worth. I had first came across this brewery at the Texas Craft Brewers Festival in 2014, when I was able to taste their Chocolate Stout. I was impressed by that beer back then, and looked forward to trying other beers by them. Thanks to the Texas Craft Pack, I was able to at least get my hands on this Fire Brewed Irish Red. Speaking of Fire Brewed, that is one thing that intrigued me about this brewery. Shannon Brewing Co. uses an old-world fire technique that enables them to precisely control enzyme activity, produce strong malty flavors, and delicately caramelize the sugars. It is an old process that is more difficult to control than other heating sources. To recreate this process, Shannon Brewing Co. commissioned a unique fire-heated mash tun. Read all about their brewing process here on their site. Shannon Brewing Co. cans their year round beers, and they all share the same design, but with a different color scheme on each. The whole can is in one solid color with a diamond shaped label being in another color outlined in white. On this can, the main color is red, with the diamond being in a darker more crimson red color. Within the diamond is the brewery’s logo, which is in a pretty plain text. The name of the beer is displayed underneath the diamond on the main colored part of the can. Honestly, there is nothing crazy special about these cans, but they get the job done. After seeing that all cans share the same design, it is apparent that when seeing these cans on the shelves, you will be able to know that these cans belong to Shannon Brewing Company. Using a slim nonic style pint glass, the beer poured a clear brownish-red color that was initially crowned with a large 1.25 inch eggshell colored foamy head. he head retained about halfway through the session, leaving soapy lacing on the top half of the glass, then disappeared the rest of the way. This Irish Red Ale had a big malty nose full of caramel, toffee, and toasted malts. There is a nice sweet sugar candy presence, along with raisins, toasted wheat bread, and some earthy hops. The taste was a big surprise, as right up front I was met with a big taste of sweet sugar candied raisins. Malty flavors of caramel, toffee and toasted malts soon follow. This one has a body of toasted wheat bread, and a good earthy hop profile. There is a lingering taste of caramel, raisins, and sweet sugar. Shannon Irish Red has a medium body with a sticky and sweet mouthfeel. This one has low-moderate carbonation. The finish is slick. Overall, I enjoyed this beer, as it really met the standards of a good Irish Red Ale. It was sweet, actually very sweet. The overall flavor of sweet sugar candy was big in the nose and taste. The bold malt flavors that made up the body, along with the earthy hop profile mixed well, giving this beer a great well balanced flavor. Each sip I took, I couldn’t help bt to imagine this beer being poured from a nitro tap, which would just intensify this beer to the highest, in my opinion.